Every user gets 1GB free storage on Easynote. This space can be used in any capacity and store anything that is important to you or your team. Keep project briefs, tenders, notes or anything that your project team needs as reference to complete your tasks. The overview of all files can be accessed in the top menu bar under ‘files’. This is a central location where you can view all files uploaded to the Project. This takes you to your file storage page where all files are able to be accessed. 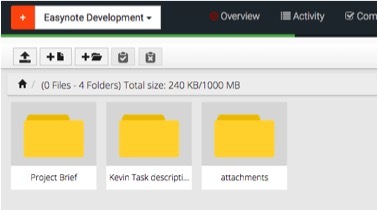 You also have the ability to manage the files here and create folders for different files so that you ca keep them organised. The files stored here are able to be organised regardless of which task they were attached to. You are also able to attach files to specific tasks. Simply click on the file storage button while in a task and a popup will appear allowing you to drag and drop the file and upload it to the cloud.